Managed IT Services are the practice of augmenting or replacing management of business functions by a third-party contractor. In the last 10+ years, managed services have grown exponentially, particularly within the IT industry. Here, managed services often include the management of technologies such as core network, telephony and data center and, in the case of legacy managed services, usually consist of core IT maintenance responsibilities like break/fix and patch management. A Managed Service Provider (MSP) is a company that owns and remotely manages a technology or service, and allows the use of said technology or service to any customer through a subscription. MSPs are growing by leaps and bounds. According to Gartner, in 2017, the managed services industry has grown by 2.7% so far. Markets and Markets on the other hand, predicts that the Managed IT sector growth will hit a whopping $257.84 Billion by 2022. With a consistently growing demand for managed services, solutions providers are heavily investing in their infrastructure to ensure cutting-edge technologies and quality services to customers. High Hardware Costs: Technology architectures are incredibly expensive to buy, with no guarantees they won’t be obsolete within two years. Increasingly Specialized Technologies: Traditionally, companies could hire a handful of IT staff to build, manage, and troubleshoot problems across the entire IT enterprise. Now, in order to ensure high performance and availability, IT teams are built for each IT function (ex. data center, security, etc.). Cost of Qualified Personnel: IT personnel are in high demand… and they don’t come cheap. Scarcity of Qualified Personnel: Even if you do have an IT team, do you have enough? Are the people you do have completely up to their ears with maintenance? Opportunity Cost of Constant Maintenance: If unencumbered by maintenance, members of your IT team could focus on business enhancing projects such as updating your CRM or developing new lead generation analytics, etc. Inflexible programs: Some service providers create rigid program specifications, at the customers expense. Flexibility is sometimes why the customer turned to Managed Services in the first place. Low Touch Customer Service: With stringent communication channels, some MSPs can automate away access to human experts. Similar to the car industry, there is an MSP for every type of consumer. With different brands, technologies, sizes, performance requirements, there will always be options. Ultimately, choosing the right MSP comes down to the types of services you want and the scope of your project. However, keep in mind that there are three general types of MSPs: Traditional, Advanced and NextGen depending on what level of engagement you are looking for. As the go-to reactive service model, Traditional Managed services can easily help with break/fix support such as network interruptions or failures. Incident & Problem Management: This is the core framework for restoring normal service as quickly as possible. Please note that Traditional MSPs usually do not include more time-consuming services like root cause analysis, which is critical to determine why things went wrong in the first place. Root Cause Analysis is part of most NextGen Managed Service offerings. System Administration: System Administration is the complete management and optimization of a customer’s designated technology infrastructure. When employed correctly, System Administration can allow IT staff to focus on key strategic areas within their organization. Patch Management: Comprehensive planning and execution of updates to software to ensure patches are tested, scheduled and rolled-out in a timely manner, without adversely impacting users. Beyond Traditional Managed Services, Advanced Managed Services offer proactive services to anticipate problems before they occur and keep your network from going down in the first place. Enhanced Monitoring: Enhanced Monitoring is all about identifying potential issues before they escalate into full-blown incidents. Most of the time an appliance is inserted into the network to enable the system to actively listen and report status 24 x 7 x 365. Service Management: Service Management provides a robust reporting, notification and communication platform to ensure real-time visibility into your covered systems and detailed lifecycle tracking of each incident or service ticket. 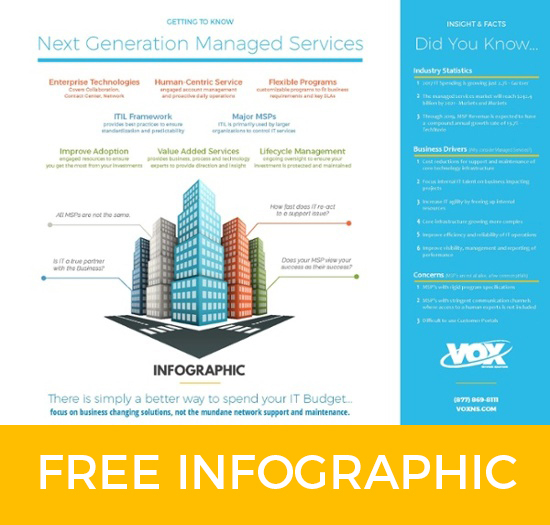 Driven by demand for more customizable programs, better customer service and robust relationships with their MSPs, NextGen Managed Services are the natural evolution of the managed service industry. High-Touch Consultative Services: With High-Touch Consultative Services come a more engaged human-to-human partnership. NextGen MSPs offer a range of industry experts who can seamlessly blend themselves into your team. By working hand-in-hand with your own staff, NextGen MSPs gain a clear, common understanding of your business goals, strategies and resources to define optimal standard operating procedures. Client Success Advocate: The Client Success Advocate (CSA) is a fundamental role in every NextGen MSP. The CSA is ultimately responsible for MSP-Client success. The CSA fully engages with the Client’s IT and business teams to ensure ongoing communications and a collaborative workflow. Enterprise Lifecycle Management (Lifecycle): A Lifecycle Program is how your NextGen MSP makes your technology roadmap come to life. Essentially, a Lifecycle program helps you understand new and existing technologies and platforms, and how / when they can best serve your organization. Ultimately, it’s about enabling your business through technology. Enterprise Adoption Management: Adoption Management is the process of making sure that your organization is getting the most of the technologies you’ve invested in. Whether it is training your staff on the capabilities of a new Contact Center solution, ensuring best practices, or monitoring and reporting, Adoption Management makes sure you are getting the most out of your resources. Enterprise Security Audit: With an ever-growing number of threats, enterprise security is paramount. Security Audit allows an industry expert to take a holistic view of your security infrastructure. If there are any lapses or organizational blind spots, the audit can identify risks and outline necessary steps to remediate. There are many MSPs out there offering a variety of services, to be consumed in a variety of ways. Many are genuine Value Added Partners. Some are mere service vendors with whom your relationship goes as far as your check does every month. So how do you distinguish a true partner from a vendor? An ideal managed IT services partner is one who gives you sound advice, challenges you, offers honest critique even at their own detriment. An ideal partner is one who is transparent in all their dealings with you and, most importantly, treats your sensitive issues, shutdowns or hiccups affecting your business, as their own. At VOX, we believe that through creating committed partnerships, engaging in our communities and empowering individuals to have a stake in the process, we create a collaborative prosperity that positively affects people, businesses and the world. For more information about Managed Services, please get in touch with VOX Network Solutions today.